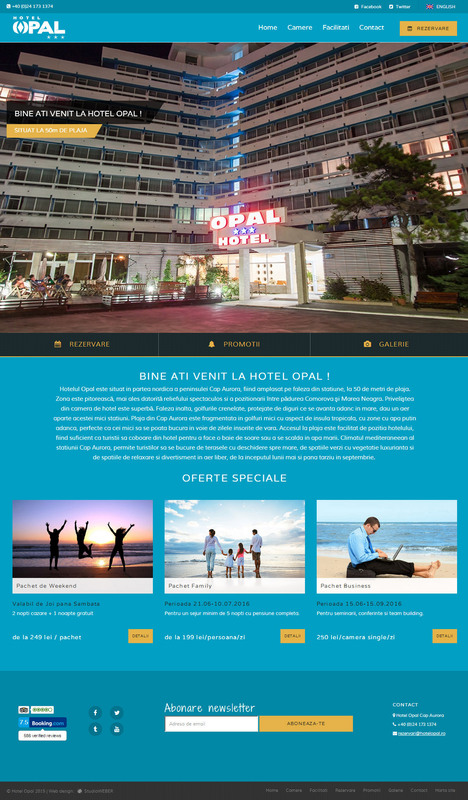 Hotel Opal - Hotel web site design and development. Hotel web site design and development. 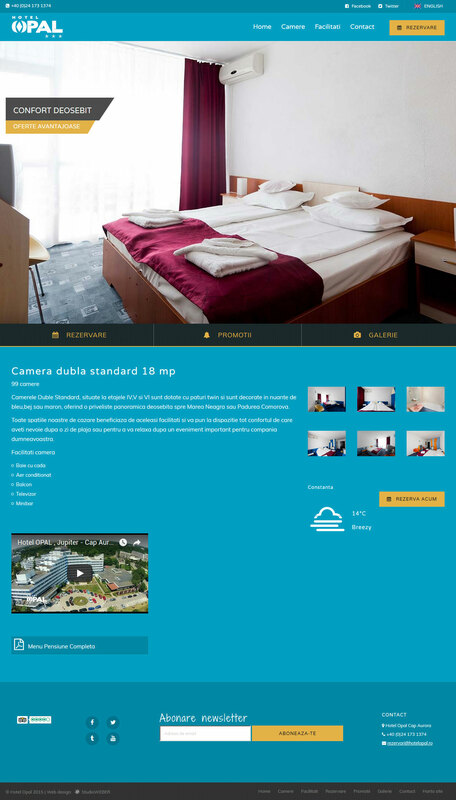 We had the pleasure to do the web site and development for one of the best hotels on the Romanian Black Sea coast – Hotel Opal. The site is custom built, no templates were used, it has a custom made Content Management System that allows quick and simple updates and it is bilingual. It also features basic SEO capabilities such as Page Titles, Meta Descriptions, Meta Keywords and Google Analytics code insertion. The site is built with Responsive technology – it automatically adapts to the device it is accessed from: desktop, tablet or smart phone. Technology used: HTML5 / Bootstrap / CSS3 / PHP / MySQL. Opal Hotel is located on the northern part of the Cap Aurora peninsula, and the resort’s seafront is only fifty meters from the beach. The surrounds are picturesque due to the spectacular landscape between Comorova Forest and the Black Sea. This landscape offers superb views from all directions. High cliffs and scalloped bays which are protected by dykes penetrating the seafront combine to provide a unique atmosphere to this cozy resort. Cap Aurora beach is split into small coves, reminiscent of a tropical island. The shallow water areas are safe, and perfect for the little ones to enjoy the long sunny days in summer. The hotel provides easy access to the beach, allowing guests to swim or sunbathe literally moments after leaving the hotel. The Mediterranean climate of Cap Aurora allows tourists to enjoy the terraces opening to the sea, lush green spaces and places to relax and entertain outdoors from early May to late September.